H generation Vauxhall/Opel Astra on sale in the UK from May 2004. Choice of five petrol engines and three diesel engines from 1.4 to 2.0 litres with power outputs of 80PS to 170PS. All are ECOTEC 16 valve engines and all meet Euro IV emissions regs. 140mm longer, 20mm wider and 16mm higher than the Mk IV Astra, which works out at 4,250mm by 1,987 (including mirrors) by 1,441mm high. New engines that came later in 2005 were a 150PS Alfa Romeo 1.9 litre CDTI and a 200PS turbo petrol engine with six-speed gearbox. Standard Astra transmission is a five-speed manual with optional Easytronic electric clutch manual or a full torque converter automatic. Adaptive ‘Interactive Driving System’ optional on quicker models with ‘Continuous Damping Control’ (IDS with CDC). The system is connected by three Controller Area Network BUS (CANBUS) systems to the dampers react in real time to variations in the road service or driver inputs. (A bit like the Volvo Type R system). Suspension itself is MacPherson struts and a separate subframe at the front with a torsion beam ‘U’ shapes axle at the rear to keep costs down. At launch there were seven trim levels: Expression, Life, Club, Design, Elite, SXi and SRi. And six engines: a 90bhp 1.4 16v, a 105bhp 1.6 16v, a 125bhp 1.8 16v, a 170bhp 2.0 turbo, an 80bhp 1.7 common rail diesel and a 100bhp 1.7 common rail diesel. 235bhp VXR turbo version from summer 2004. Excellent 90PS version of 1,248cc chain cam diesel announced April 2005. 6-speed transmission. Up to 70.6mpg (58.9mpg combined). 130g/km C02. BIK band 15%. Insurance Group 4E. Prices start at £13,895. 2007 model Astra from January 2007 with new front and rear light lenses, revised front bumper, extra chrome detailing on the grille and option of piano black or matt chrome interior detailing. Sport Hatch has new honeycomb-style front grille. New 180PS/230Nm torque 1.6 turbo replaces 2.0 170PS turbo. 0-60mph in 7.8 seconds (5-dr hatch), top speed of 137mph. Combined economy of 36.7mpg and 185g/km CO2, so now Band D VED. 1.6 TWINPORT engine replaced by revised unit with power increased from 105PS to 115PS. Available in Sport Hatch, 5-door, TwinTop and estate versions of Astra, this emits 156g/km CO2 (Sport Hatch and 5-dr), and 158g/km (estates). 0-60mph in 10.9, top speed of 119mph and 43.5mpg combined. Prices for the new 1.6 TWINPORT models start at £13,515 on-the-road for the 1.6i Life 5-dr model, while 1.6 Turbo variants begin at £18,200 for the SRi Sport Hatch. Prices on other models across the range are increased by £15. ECOFLEX Astra announced CO2 emissions of 119g/km, so lowest tax band for company car drivers and £35/£30 VED. 62.8mpg on combined cycle. 110PS, an increase of 10PS over the existing Astra 1.7 CDTi, and 260Nm of torque at 2000rpm, enough to power the ecoFLEX to a top speed of 117mph. Taller axle ratio, optimsed engine management system and reduced the engine idle speed. Kerbweight has been cut by 30kgs, while aerodynamics have been improved by lowering the suspension, modifying the front air intakes and fitting a drag-reducing lower engine compartment panel. Power steering pump’s idle speed also reduced. Low rolling-resistance, 15" tyres (16-inch optional). Starting price for the Life (a/c) model of £16,340. 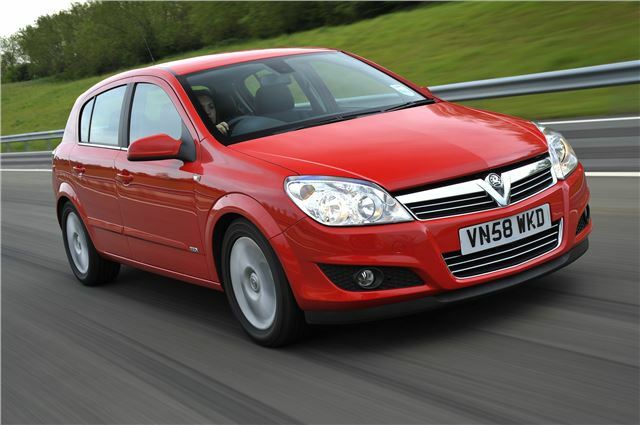 All 2009MY Astra Estate, Sports Hatch and 5-door models join popular ecoFLEX range priced from £16,340OTR. With CO2 emissions of only 119g/km, these ecoFLEX models fall within the lowest, 13%, diesel band for Benefit-in-Kind (BiK) tax – and with an estimated combined fuel consumption of 62.8mpg. All feature a 1.7 litre, 110PS common rail turbo diesel engine with 6 speed transmission, diesel particulate filter and lowered chassis, with the Life (air conditioned) ecoFLEX model featuring Low rolling resistance tyres on existing 15 inch wheels.